Stevie Wayne is a single mother who runs a radio station from the lighthouse at Antonio Bay. Kathy Williams learns from the vicar about the town's curse and considers the celebrations a sham. However, for the sake of the people she is persuaded to go through with them regardless. The fishing trawler, The Sea Grass is the first subject of retribution, when an ancient ship emerges from a ghostly glowing fog and barely seen figures butcher the handful of men. During a candlelit vigil held by the town, the fog rolls in along the coastline. Stevie Wayne warns the people via her radio station, and stays at her post to report on its curiously purposeful direction ("There's something in the fog!"). She tell the fleeing people to congregate at the church, but is besieged herself at the lighthouse. The church proves to be the focal point, as the stolen gold being transported by the Elizabeth Dane was forged into the large cross which adorns the church. Then the figures emerge from the fog. Anyone who knows me or has followed my reviews will be aware that I think John Carpenter is a genius writer, director and composer. Often with very little budget he creates simple but original and effective psychological siege movies. For me, a new Carpenter cinematic or special edition DVD release is an event to celebrate. Many casual followers of the man will cite his early films as the only ones worth noting, but this is not only unfair but also untrue. However, I will concede that there were some early classics which retrospectively became genre favourites. Although perhaps not remembered in the same light as Halloween and Assault On Precinct 13, The Fog (from 1979) is one of my favourites. The balance and pacing throughout is spot on, the lighting as near to perfect as possible, and the music score easily one of his best (it certainly enhances the movie, making it doubly effective). The Fog is a traditional ghost story with a difference. Like all good notions the origins began with a simple premise. John Carpenter's Halloween appeared to bomb upon its first release. He shrugged it off and began work on the Elvis TV movie with Kurt Russell, only to be informed it was receiving rave reviews (it went on to be the biggest grossing independent film until the release of The Blair Witch Project, raking in a $50 million return from an outlay of just $320,000). This success prompted a two-picture deal with Avco Embassy, the first of which was The Fog. Carpenter and producer Debra Hill were in England and decided to visit Stonehenge. Behind it was a low, eerie mist which seemed to pulsate, and Carpenter commented, "What do you suppose is in the fog?" Keen to follow-up Halloween with another scary tale, Carpenter borrowed a true event from the 1700s when a ship laden with gold was lured on to the rocks by the locals. The crew was drowned and the gold stolen. The Fog therefore is essentially a supernatural tale of revenge. I imagined this release to simply be the region 2 version of the special edition that first emerged two years ago on region 1, but there are subtle differences. Firstly, the animated menus are better on region 1, and there are a couple of additional trailers. There is also the choice of standard or cinematic widescreen formats on a single two-sided disc. This region 2 version is spread inexplicably over two discs, when everything would comfortably have fitted on one. There is a nice photo gallery though, and a not too hidden easter egg showing a few behind-the-scenes moments. 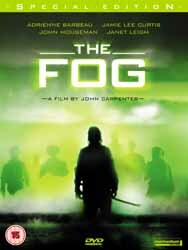 Other extras here include, Fear on Film - Inside The Fog (a short documentary from 1980); Tales From the Mist - Inside The Fog (a much longer documentary from 2002); a montage of outtakes; a split-screen storyboard to film comparison; and a quite excellent informative and entertaining commentary by John Carpenter and Debra Hill. Minor quibbles aside, this set is well worth owning. The picture quality makes the old video seem from the dark ages, and the sound... Oh, the sound! Just listen to the music on Dolby 5.1 (particularly what the film soundtrack calls Reel 9), you won't be disappointed.